Con Price premium, driver mode overload? We’re big fans of AMG’s GT R here on evo. It’s a riot on the road, and as capable on track as it is fun, which is to say ‘very’. 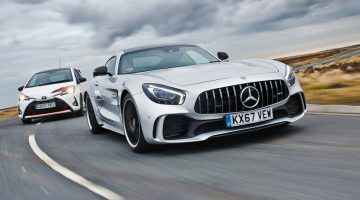 However, AMG has shifted its focus even more to track work with this, the new Pro version: is it worth the price premium, and does it turn the GT R into a convincing rival to Porsche’s GT-series cars? This is one area where the Pro is no different to the standard GT R, but overall that’s no bad thing. The 572bhp ‘Hot-V’ twin-turbo V8 feels as exuberant as ever, punching hard with its peak torque of 516lb ft from just 2,100rpm, and then revving out with a magnificent bent eight bellow; in many ways it defines the whole car. It’s connected to a seven-speed DCT gearbox worked via paddles behind the steering wheel, which helps the Pro to a 0-100kph time of 3.6 seconds and a top speed of 318kph. At the heart of the Pro’s offering are four manually adjustable coilovers, offering pre-load, rebound and compression settings, the latter for low and high speed. Obviously, that means there’s no longer a button on the centre console to adjust the damping, rather any changes have to be done crouched next to the car. It’s joined by a carbonfibre adjustable anti-roll bar on the front axle (an adjustable steel bar is at the rear), while the GT R’s uniball spherical joints on the lower rear wishbones are used on the upper wishbones, too. A carbonfibre shear panel adds rigidity to the structure by bracing the body underneath, while the GT R’s dynamic engine and transmission mounts have been re-tuned to suit the Pro’s more track-focused brief. The Pro package continues with the fitment of the Track Pack and ceramic brakes as standard, both options on the regular GT R, the former bringing an extensive roll-cage, a four-point harness and a fire extinguisher. The forged wheels are finished in titanium grey, while the roof panel is now also carbonfibre also and features a truncated middle section: the AMG carbonfibre package is also standard equipment, and the total weight saving in fact is 14kg over the regular GT R. That doesn’t sound like much, granted, but take into account that the cage of the Track Pack puts some kilos back into the car, so a like-for-like comparison would show a greater difference. The other major change with the Pro is its increased aerodynamic performance. Louvres slashed into the front wings extract air from the front wheel arches, thereby cancelling lift, and the larger front splitter that juts out from the nose is complemented by dive planes attached to the front corners of the car. A vertical blade behind the rear wheel arches helps channel the air aftwards, while the rear wing has an additional gurney flap for increased downforce and now sits on milled alloy supports. It’s not as though the GT R was a weak-looking car anyway, but the Pro definitely has an even more purposeful air to it. Finally, all AMG GT’s now benefit from the latest Mercedes cockpit design and technology – a fully digital instrument binacle with a 12.3” screen, complemented by a 10.25” multimedia display in the centre console. You can choose from three different layouts for the ‘dials’, and it’s almost endlessly configurable via switches on the new steering wheel, along with further buttons on the GT’s broad centre console for adjusting the multi-stage dampers, the esp setup, the exhaust valves, and so on. There’s also now the rotary mode switch on the wheel, plus a pair of multi-configurable switches just off the rim, that can also adjust any of the aforementioned parameters. 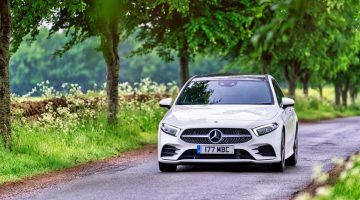 With AMG Dynamics, not only is there now Slippery, Comfort, Sport, Sport+, Race and Individual overall driving modes, there is are also Basic, Advanced, Pro and Master settings that affect steering weight and the ESP setup. 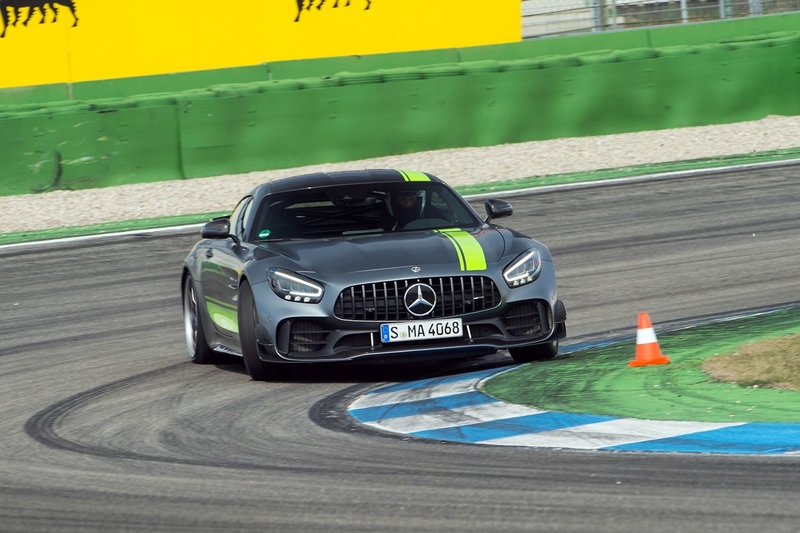 Our first encounter with the Pro amounts to no more than a handful of laps around the Hockenheim circuit, and with no provision to compare it with the standard GT R either. Therefore it’s difficult to draw too many conclusions at this stage about the Pro’s ultimate abilities, except to say it feels very much at home on the track. It swallows the wide long straights with ease, the new instrumentation flashing red to nag you to upshift, the V8 thundering away as though the exhaust exits almost underneath the driver’s seat. That sense of theatre is something the Pro never loses, whether it’s the driving position, which sets you low in the car with the wheel near the chest, or the view to the rear obscured as it is by roll cage, or the vibrations of the engine – there’s never a dull moment in the Pro. It’s always a shock in a GT R to discover how quickly and sensitively that long nose ahead changes direction, and the Pro is no exception. 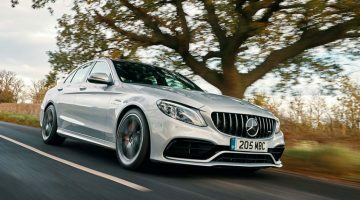 It turns into corners really positively, and while oversteer is only a squeeze of the throttle away in most scenarios, neither is the Pro the sort of car to squander acceleration out of tighter curves. As long as you’re progressive it finds excellent traction, aided of course by its nine-stage traction control setup, accessed via the yellow switch in the middle of the dash. When it does start to move around, the proximity of the driver’s behind to the rear axle and the accuracy of the chassis means it’s not a scary car, despite its threatening visuals and soundtrack. The ceramic brakes on the car we drove were clearly past their best with countless track sessions, but still pulled the car up convincingly without any lengthening of braking zones. Nevertheless, while the speed of upshifts is decent, a slight delay on downshifts means it feels as through the box can only just about keep up when the car is losing speed rapidly. The GT R Pro is very much AMG’s ‘911 GT3’, but of course, until the advent of the new 992 GT3 in due course that particular rival is not currently rival. On price, the Pro isn’t far behind McLaren’s brilliant 600LT (our current ECOTY champion) but it’s a credit to the AMG that the comparison doesn’t feel like a foregone conclusion.